Heterotopia is defined as clustering of the normal neurons in abnormal locations as a result of interruption of the radial migration from periventricular germinal layer to the cortical layer during intrauterine period. It has been classified into three subgroups as subependymal, focal subcortical, and band heterotopia, according to the site of abnormal location. These subtypes of heterotopia can represent various clinical signs including seizures (Lennox–Gastaut syndrome, infantile spasms, etc. ), mental and motor retardation, dysarthria, tetraplegia, and hemiplegia. Diagnosis is made by magnetic resonance imaging (MRI) studies by observing a signal characteristic to cortex in the white matter on all sequences. Periventricular nodular heterotopia (PNH) is characterized by subependymal location of heterotopic gray matter in the walls of ventricles. Frontocentral region is the most common site of location.,FLNA gene mutation is found in all cases of PNH and in 20% of sporadic cases. 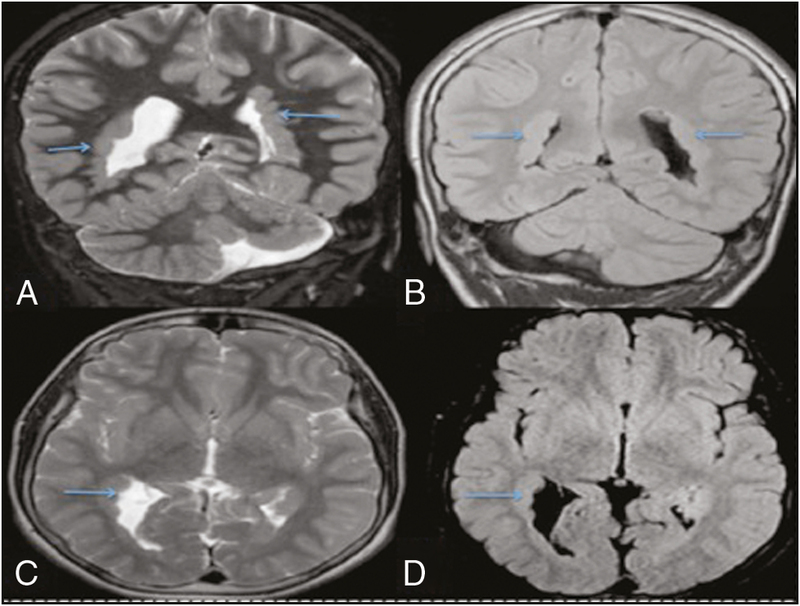 Recently, a subgroup of heterotopia has been defined in a few patients with a negative FLNA mutation and posteriorly located heterotopia.,, This paper presents a patient representing refractory epilepsy in which posterior PNH was diagnosed in brain MRI as a rare cause of refractory epilepsy of childhood. A 15-year-old male patient referred to our outpatient clinic with refractory epilepsy. Medical history revealed complex partial seizures that first began at 1.5 years of age, which was treated with carbamazepine for 2.5 years. As seizures stopped, the drug was ceased gradually, resulting in no more seizures for 3 years. Although carbamazepine was restarted 3 years later because of recurrence of seizures, the patient had seizures 3–4 times in a month and even several times during a day on some days. The parents reported that he was born in hospital by spontaneous vaginal birth, he had no prenatal and postnatal health problems, he is successful in the school and he also had a healthy brother. And the parents had no consanguineous relationship. On physical examination, neuromotor development was found to be appropriate for his age. Neurological examination revealed no pathological findings. Complete blood count and biochemical tests revealed normal findings. On the other hand, electroencephalography showed slow spike and wave complexes arising from the posterior regions of the right hemisphere. Cerebral MRI obtained to determine the etiology of seizures revealed left cerebellar dysgenesis and bilateral peritrigonal and temporo-occipital heterotropia (suggestive of posterior PNH) [Figure 1]. Because of ongoing epileptic seizures, levetiracetam (40mg/kg/day) and zonisamide (5mg/kg/day) were added to carbamazepine (30mg/kg/day) treatment, respectively. FLNA gene mutation was found to be negative. The patient was asked to follow- up every 3 months at outpatient clinic, and he reported no more seizures for the last 2 years. In their study on 50 patients with PNH, Pisano et al. identified treatment-resistant epilepsy in 62%, cognitive disorders in 56%, autism in 12%, and cerebellar abnormality on brain MRI in 56% of the patients. The authors suggested that any type of seizures can be seen in these patients, with treatment-resistant complicated partial seizures being the most common. Our patient had treatment-resistant complex partial seizures that could be controlled with triple antiepileptic drugs. When compared to the patients with mutation-positive PNH, the patients with FLNA-negative PNH more commonly have other brain abnormalities (hydrocephalus, microcephaly, frontonasal dysplasia, etc. ), and they are known as being a part of infrasylvian developmental disorder.,, Mandelstam et al. studied the cerebral abnormalities associated with bilateral posterior PNH and found that most commonly associated disorders are corpus callosum dysgenesis, colpocephaly, cortical abnormalities, hippocampal abnormalities, and infrasylvian developmental disorders. Accordingly, our patient had left cerebellar dysgenesis associated with posterior PNH. FLNA mutation-negative posterior PNH is concluded to be a subtype of classical PNH or caused by a currently undetected abnormality on FLNA gene. The patient presented in this paper was also negative for FLNA mutation. Posterior PNH is a cortical developmental abnormality, which is not only characterized by the location of nodules but also associated with refractory seizures and brain abnormalities with no FLNA gene mutations.,[6-8] A limited number of cases of posterior PNH and accompanying abnormalities have been reported.,, Therefore, it was aimed to emphasize that epilepsy may be more refractory to treatment, and central congenital abnormalities including posterior fossa abnormalities are more frequent in patients with posterior PNH, which should be considered when etiology of epilepsy is investigated in this group of patients. Battaglia G, Chiapparini L, Franceschetti S, Freri E, Tassi L, Bassanini S, et al. Periventricular nodular heterotopia: classification, epileptic history, and genesis of epileptic discharges. Epilepsia 2006;13:86-97. Parrini E, Ramazzotti A, Dobyns WB, Mei D, Moro F, Veggiotti P, et al. Periventricular heterotopia: phenotypic heterogeneity and correlation with filamin A mutations. Brain 2006;13:1892-906. Mandelstam SA, Leventer RJ, Sandow A, McGillivray G, van Kogelenberg M, Guerrini R, et al. Bilateral posterior periventricular nodular heterotopia: a recognizable cortical malformation with a spectrum of associated brain abnormalities. AJNR Am J Neuroradiol 2013;13:432-8. Kovac S, Micallef C, Diehl B, Duncan J. Mystery case: bilateral posterior periventricular heterotopias. Neurology 2013;13:e163-4. Guglielmi V, Floris R, D’Adamo M, Garaci F, Novelli G, Sbraccia P. Massive obesity and hyperphagia in posterior bilateral periventricular heterotopias: case report. BMC Med Genet 2016;13:18. Pisano T, Barkovich AJ, Leventer RJ, Squier W, Scheffer IE, Parrini E, et al. Peritrigonal and temporo-occipital heterotopia with corpus callosum and cerebellar dysgenesis. Neurology 2012;13:1244-51. González G, Vedolin L, Barry B, Poduri A, Walsh C, Barkovich AJ. Location of periventricular nodular heterotopia is related to the malformation phenotype on MRI. AJNR Am J Neuroradiol 2013;13:877-83. Liu W, Yan B, An D, Xiao J, Hu F, Zhou D. Sporadic periventricular nodular heterotopia: classification, phenotype and correlation with filamin A mutations. Epilepsy Res 2017;13:33-40.